Welcome to Cupcake Tuesday! If you are new here, grab a cup of tea or a glass of milk and enjoy a cupcake! Are you having a great Summer? Ours is flying by, as I’m sure yours is too! 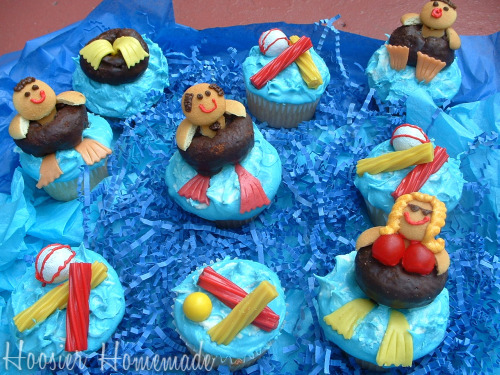 How about some fun Pool Cupcakes to celebrate a fun outing to the beach or pool? And how about a video to show you just how to create these fun and easy cupcakes, that were inspired from the What’s New Cupcake? book. Don’t you love my Cupcake Apron? My good friend, and blogging buddy, Diane over at Created by Diane sent it to me! Which one is your favorite? I love the Bikini Queen! Be sure to head on over and link up to Delicious Dishes (Tues a.m.) on It’s A Blog Party, my other blog, where I host a different linky party everyday! I’m starting a new, yummy giveaway too! So…tell me? Do you watch Cupcake Wars? Would you be interested in a little friendly competition? 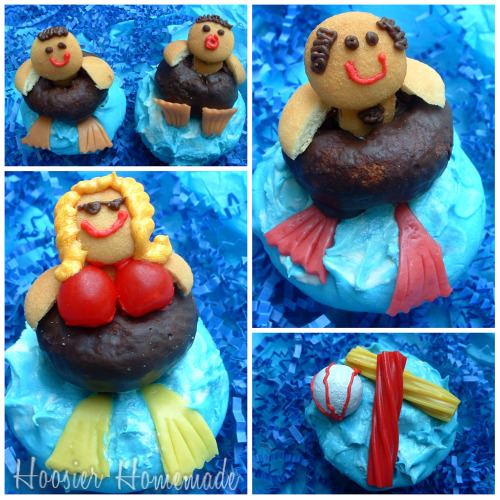 A Cupcake Competition? With cool prizes? Let me know what you think! Now, it’s time to share your creations! Please be sure to link back to this post so your readers can enjoy all the entries and visit one or all of the participants. I have that cookbook, I love how you did a video, I can use all the help I can get! LOL! I am a new follower! LOVE your apron!!! Thanks for the mention, you are so wonderful. I love all that you are doing. Your website looks so delicious!!! They look so fun 🙂 I linked up 🙂 thank you!!! That bikini queen is a RIOT! You are the undisputed queen of cupcakes, Liz! 🙂 Bikini queen gave me a chuckle for sure! Those are such cute cupcakes. I love that you get a cupcake and a donut! What darling little cupcakes! My kiddos would love them! LOL…oh my! Of course, the “Bikini Queen” is my favorite! Love these cupcakes!! i LOVE the vlogs, keep them coming!! i have both cupcake books–they are so inspiring! @sarah burke, Thanks Sarah! I’m just thrilled to hear that!